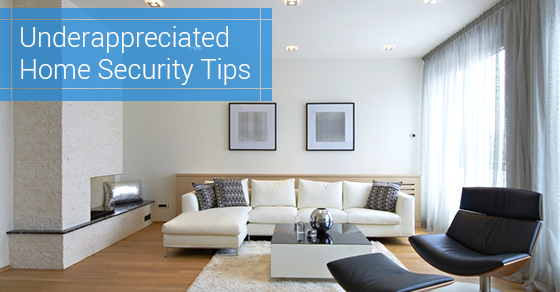 7 Underappreciated Home Security Tips | Calgary Alarm Inc. It does not take much to improve home security, and there’s an assortment of products and solutions to suit all tastes and budgets. Some basic tips — don’t leave any tools or objects lying around near your entrances that might enable an intruder. Anything you can do to slow a burglar down, create more effort for them to get in and out, or raise attention to the neighbours, will help prevent them from targeting your house. And anything you can do to minimize the perceived value of your house will give thieves less incentive. Lights: Leaving a couple lights on in your house while you’re out, as well as along the perimeter during night time, including main entrances, and more importantly darker areas, like rear doors. Proper lighting will deter a person from breaking in. Doors: All exterior doors should be made of solid, strong materials. Wooden doors should be solid core built with a minimum thickness of 1 ¾ inches. This rule also applies to the external, pedestrian garage door and the door giving access from the garage to the house. Windows: There are many effective ways to protect entry via windows, especially when used in combination. For instance, thorny landscaping, like cactus and rosebushes planted in front of vulnerable windows, can deter a thief, especially when the window is safety-coated. Locks: Single-cylinder deadbolt locks are a must for every single- or double-entrance door. The bolt should have a minimum projection of 1-inch into the strike plate. The cylinder should have a minimum of five-pin tumbler, a cylinder head, and should be connected to the inner portion of the lock by connecting screws. Heavy Shades and Curtains: Using heavy window treatments in rooms with expensive equipment or valuables. An intruder will often walk up and look through a window to see if there’s anything worth stealing before breaking in. Although thin, sheer drapes are attractive, they should be avoided. Multiple layers of security: It’s fairly easy for a burglar to get past a single line of defence. Multiple layers will not only slow them down or deter them from proceeding any further, but also increase the effectiveness of your surveillance system or of a neighbour spotting the intruder. Consider rosebushes planted outside a double-locked window that is barred and safety coated; or a solid wood door with braced door frames and multiple locks. Etching your name on all expensive equipment, like the TV, computer, and stereo is another effective strategy that is often overlooked. Etching itself is a great deterrent in the event of a break in, plus it helps the police to recover your property.